A request to all Motor Racing Fan’s Mr, Bob Jane himself is in trouble and will lose his home unless dedicated Fan’s like yourselves can step in and raise as much money as needed to save the sale of his home through unpaid court costs caused from Family feud by his son Rodney,who has taken away his dreams to continue working at such a late stage in his life ,he has beaten Cancer but this unprecedented case has gone on for a while leaving the all time Master of his own game out in the cold from his beloved Motor Racing track at Calder Park here in Melbourne and now his only home,He has given all of his life to the Motoring Industry and well deserves for community to be there for him. Victoria alone this year has now produced more than 30 first division winners in the lottery , anyone of you who has some spare cash and I’m sure you do please find it in your heart to come forward and even offer a loan to stop the sale of this man’s home to recover money for court costs he incurred through family greed,don’t just sit there if you can help there are more Angles out there than myself. For Your Pleasure,with the KING OF THE MOUNTAIN anniversary coming up There is only one of these and I own it “Enjoy” Motor Racing seemed empty when Peter Brock departed from this life. 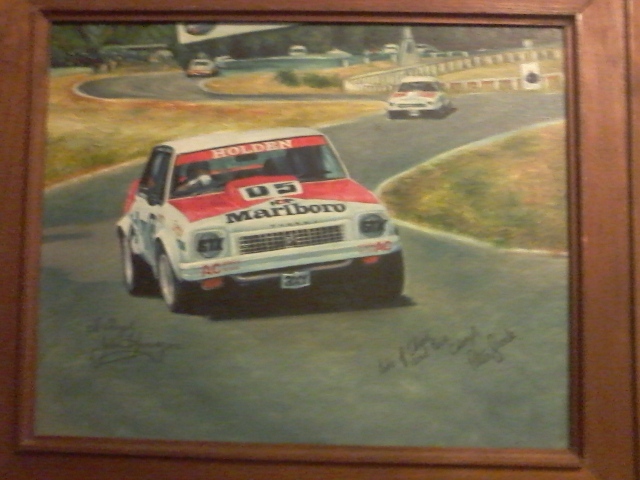 The picture’s, are from a V8 Supercar round at Sandown Raceway here in Melbourne,the oil painting was initially made for one of Peter Brock’s birthday’s but it turned out so good my statement to Peter was I guess it is as good on my wall as it is on your’s and there it stayed heavily insured this has never been published before and would be valueless to any wood-be thieves because it’s signed to Cheryl. My feelings for that of a community member towards these people is that of disgust and I can tell you if I had still been a temporary Volunteer for Motor Racing today I would have walked away with my head held high and would have encouraged every other Volunteer to do the same because without them a Race Track is non-functional and they get paid nothing after all these decades. Informative information —-Mr Bob Jane has never signed “his”Calder Park Raceway over to son Rodney and never would and yet Rodney currently has control of it I did say currently it’s time the courts woke up to this kid who is out there buying millions of dollars worth of property,and benefits from the Bob Jane T/Marts name and even nephew Kim Jane races a Ute under the Bob/Jane banner how dare all of them treat Bob Jane with the disrespect they show and still use his name for their benefit shame on you all you are despicable as you have offered him no support,family members can often be the worst perpetrators of greed. Very pleasing to see that recently Bob Jane became inducted into the Hall of Fame for Motor Sport of which he so deserves.